Bill Charney and Miriam Carver co-authored this groundbreaking resource – the first “play-book” for effective board decision-making. 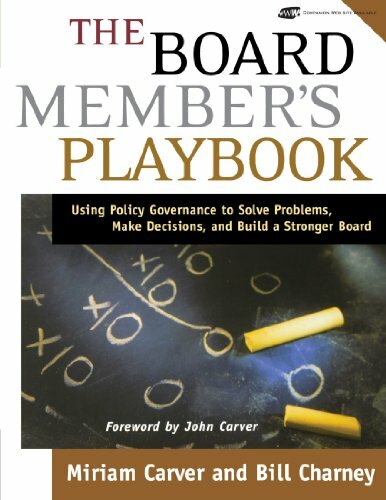 The Board Member’s Playbook features a worksheet that guides any board or board member through the process of using policies (either samples providing in the book, or their own board policies based on Policy Governance principles) to solve virtually any problem or board challenge. With introductory chapters that introduce the notion of “boards as teams” and the role of “rehearsal” in enhancing virtually any team’s performance, as well as an overview of the Policy Governance model, the Playbook demonstrates how a “systems-based” approach to good governance is not just theoretical – it’s practical! The primary tool provided in the Playbook is the “Rehearsal Worksheet,” laying a concise sequence of four questions, starting with “What has the board already said in its relevant policies?” When these questions are answered vis-a-vis any given scenario (i.e. hypothetical or actual question/dilemma that comes to the Board or a Board member), boards invariably find they are able to resolve the scenario based on previously stated board values and expectations. The book provides 50 scenario examples, accompanied by blank worksheets, as well as worksheets completed by Bill Charney and Miriam Carver (referencing the sample governing policies in the Playbook).